Melt the butter in a large (10″) non-stick sauce pan. Saute shallots until they become soft. Add the cooked shrimp and crab meat. Stir together of medium-high heat. Add whiskey. Turn heat in high, and CAREFULLY flame the dish. (This burns off the alcohol and concentrates the flavors. Stir in half and half and yogurt. Stir until well mixed. Note: I don’t have access to fresh crab. I used canned crab, which increased the sodium content. But the dish was still really tasty and a nice change of pace. 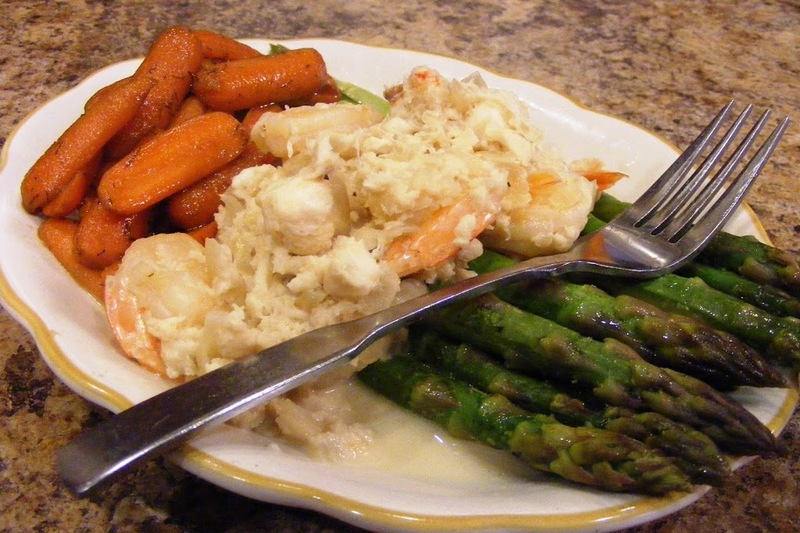 Also, traditionally is only uses crab, but I had shrimp on hand so I used that in addition to the crab. It worked. Cut the carrots in half the long way. Place carrots in a non-stick saute pan over medium heat. Add beer. Bring to a boil, cover and reduce heat. 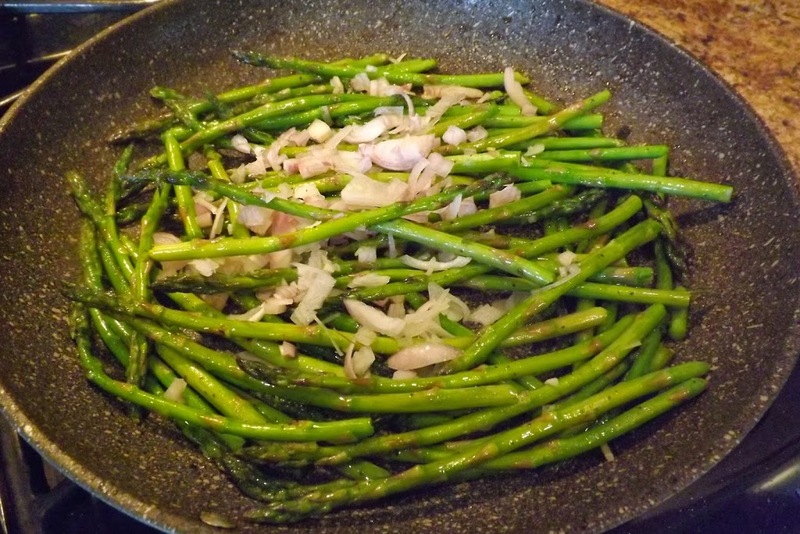 Just before serving, add a teaspoon butter and dill. Toss to coat and serve. 1. Place chicken between thick sheets of plastic or in a large freezer Ziplock bag. Pound breasts flat (to less than 1/2 inch) with mallet. Sprinkle with your seasoning. Drizzle 1 tablespoon olive oil over each breast, return to Ziplock bag and let them rest in the refrigerator for at least 1 hour. 2. Heat non-stick skillet. Add 1 tablespoon olive oil. When hot, lay chicken breast in and cook over med-high heat for 5-6 minutes. Remove from skillet, cover and keep warm. 3. While the chicken is cooking, slice the shallots the long way into thin strips. 4. In the same skillet, add remaining olive. When hot, add shallots and mushrooms. Saute until the mushrooms get soft (5-10 minutes.) Remove from skillet, cover and keep warm. 5. Add wine, and using a plastic scraper/spatula, loosen all crusty bits. Cook down for 5-10 minutes. Return mushrooms/shallots to skillet, toss to coat. 6. 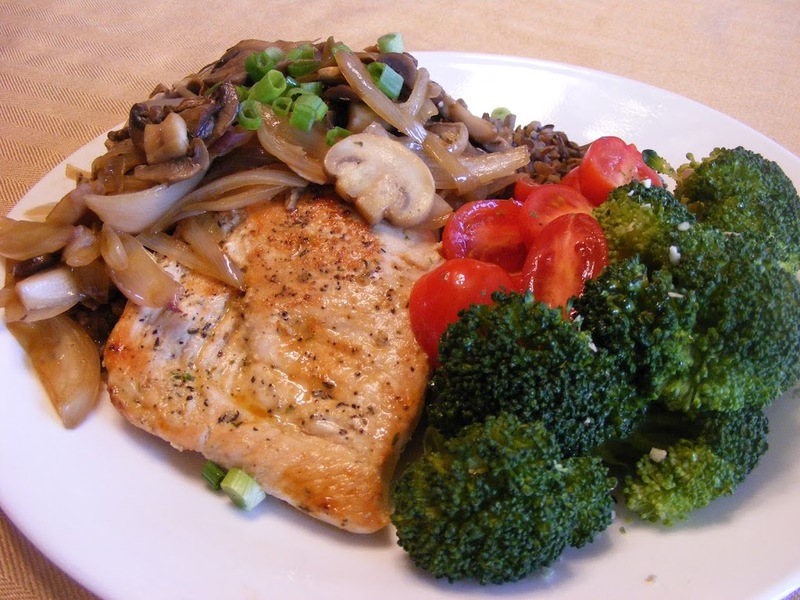 Serve chicken breasts topped with the mushroom/shallots, with a side of wild rice (cooked according to directions) and steamed broccoli (with 1 tablespoon olive oil over the broccoli) and some cherry tomatoes.